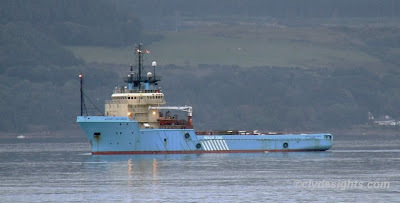 Two arrivals this evening were both vessels involved with SOLITAIRE, the pipe-laying ship presently lying off Cumbrae. First to pass Cloch Point inbound was the tug CARRON, towing a barge with this ship, MAERSK CHALLENGER, following a few minutes later. MAERSK CHALLENGER, which was built in Denmark in 1986 as CHALLENGER III, is owned by a Canadian subsidiary of the parent Maersk company. She is 2,906 tonnes deadweight and has an overall length of 75.4 metres. In 2002 she was tranferred to the Canadian registry, and spent some time working off the east coast of that country. A powerful ship, her 14,400 bhp engines gve her a bollard pull of some 173 tonnes. MAERSK CHALLENGER, and CARRON, both headed upriver to Glasgow and are berthed at Shieldhall.